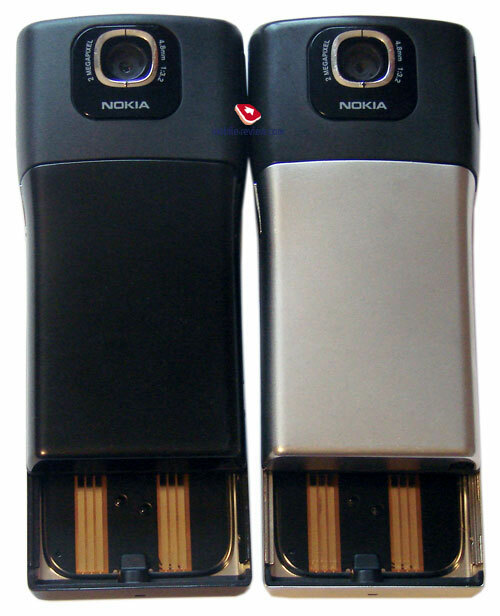 In this article we put through its paces one of the strangest upgrades in Nokia’s history. 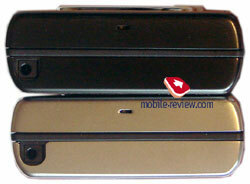 Why Nokia N91 didn’t get “i” index like the rest of the updates, and sports the offbeat “8 Gb”? 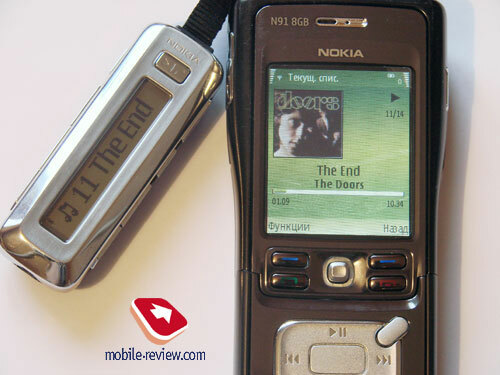 Why was it announced along with Nokia N70 and N73 Music Edition, at least in leaflets and ads it is linked up with the ME? 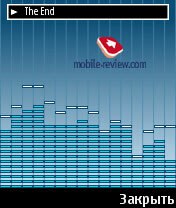 In fact the market hasn’t seen a smartphone more music-heavy than the N91, so what this special edition is all about? Finally, why the end-users are allowed to know only about the increased hard drive capacity and kept unaware of some other decent additions? Incidentally, the reviews on this very handset available on the Web right now contain inaccuracies that might affect your decision. For this article we got our hands on the N91 8 Gb’s commercial version, meant for retailing, in other words the very final edition of the smartphone and I do hope that after this review’s release date, no further updates to the software will be made. The structure of this review differs from what you have come to expect, as there aren’t too many things I can dwell upon, therefore I am just running through the foremost changes and draw a conclusion on whether the 8Gb edition is worthy of your original N91’s place. Now let’s take the plunge. - The most important, craved-for and hyped update – support for A2DP. Hold your breath now, as it is… in! 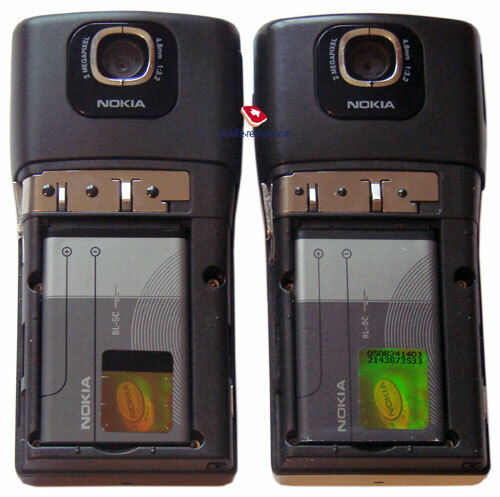 And don’t trust those claiming that it is missing on the N91 8Gb – we managed to pair up Nokia HS-12W and SonyEricsson HBH DS-970 with the handset. 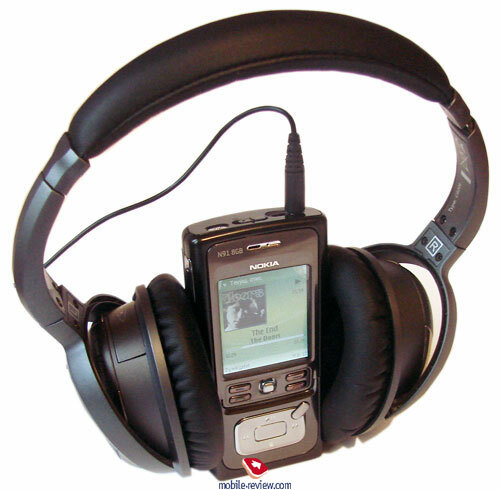 In the former case the headset displayed track title properly, but fell flat in terms of sound quality, which could be barely rated as “good”. The “opposing” gadget never delivered any issues with connection or stereo-sound transferring, but track title was missing on its TFT display. The DS-970 offered us excellent sonic experience – its volume level proved to be sufficient and a bit more than that all the time. Both headsets had no problems with volume control and track switching. 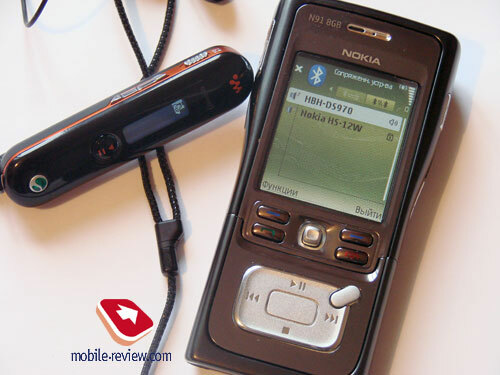 In passing, the handset’s user guide features Nokia BH-500 as a recommended accessory. - A glimpse of changes to the software, some of them come as a big surprise and are most welcome. Repeating the same old words about the platform is senseless – you can learn more about it from a dedicated article here. As regards the highlights of the N91 itself, corresponding review will shed some light on its features. For now, let us begin with the player-related changes. First, while at playback screen, the display’s top part holds a status bar presenting you with charge indicator, signal strength, active connectivity protocols, etc. This is a really big plus and the thing that will cater to music aficionados, as they will spend most of the quality time with the device at that screen and thus will still be able to keep track of what is up with the phone. By comparison in the N91 to check battery status you had to go back to the music library. Second, the player menu now feature Visualization item, enabling you to pick a still image, animated oscillograph and spectrum. To my mind, an appealing add-on, at least it will do for some playing around at first and showing off. Visualization effects can be engaged only from the playback mode. Now about other changes to the multimedia department in brief. - The sound recorder can now write 30-minute long clips, an unquestionably improvement. - The Gallery has transformed into something more appealing and easy-to-work, and looks more like the N80 and N73 implementations – a sort of revolver, where as the N91 sports much simple and ascetic style. Again, to me, it is a good thing. - The menu tree presents you with Internet folder, containing Internet-browser, Download! Utility for uploading applications onto the smartphone (like that found on other N-series solutions, for instance, the N73). 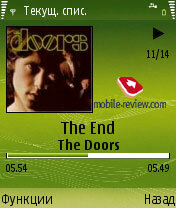 Radio has moved to Multimedia menu, as opposed to the stand-alone item, the Clock has undergone just the same change. Apparently, Nokia Life Blog comes pre-installed with the phone. The Connectivity folder has been left unchanged, saving for the Home Network shortcut, which serves for trading data back and forth with your home network utilizing a wireless hotspot, if you happen to have one. - Radio hasn’t changed a bit, which is a shame – being not able to record broadcasts onto the hard drive. - As for the hard drive itself, the most interesting parameter, recording speed, is no different compared to the predecessor. I didn’t use any tests, and preferred rating this aspect by transferring a 16 Mb big file (USB 2.0). 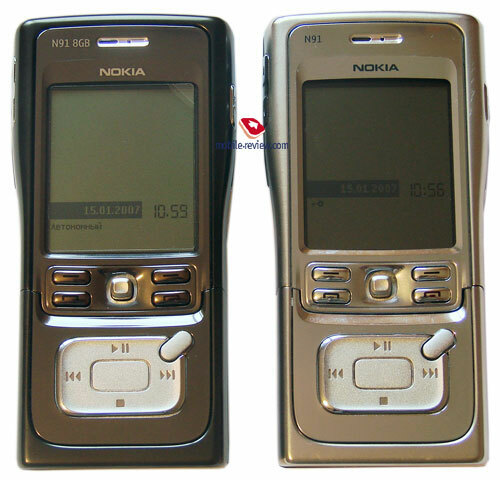 In the case of the N91, and the truth is with its “extended” edition, the outcome proved to be one and the same – 20 seconds. Nevertheless, the whole 8 Gb get filled up with music very slowly, so that you literally start whistling and hoping for an approaching end of all this. What’s the benefit of having 8 Gb onboard? More music, and, generally more content – that is all. In reality, though, you will barely be in dire need of all that “more content”, and I had a hard time guessing when I would find this much time to listen to these “days-of-music” (I really get amused when after updating the hard drive it shows me, for example, “1 day 19 hours” of music). - Font width has increased in some places, for example, at the standby screen. 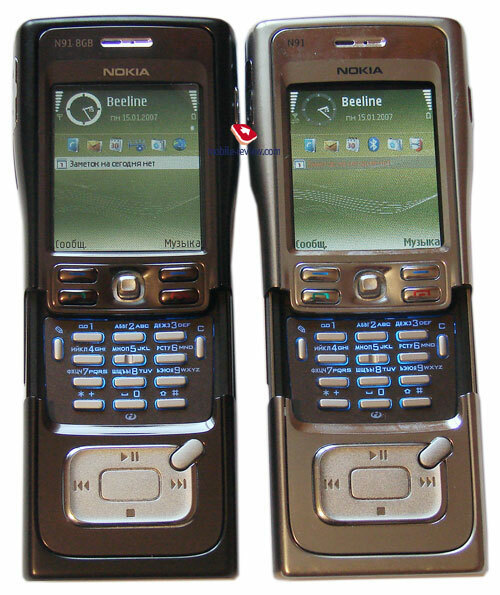 - As you might have already noticed, the trim is now different – to my liking, it has changed for the worst, since metal looks good when polished and free of any colors, this is why the N91 and the gun edition of Nokia 8800 are so eye-candy. Personally, I have already gotten bored with black – it acts great in terms of practicality, but then prime solutions get to seem undistinguishable from lower-positioned offerings. In case with the N91 8 Gb I just can’t sit with my hands folded and put up with the color scheme, over and above the color combination here is really odd. The fascia – darkened “liquid metal”, the rear and the frontplate’s edging – black color, while the side-mounted keys, joystick and music controls are all silver – which makes me wonder why they would need to do so, as they could have easily deck them out in the same color as the front panel or even black. Eventually you get the feeling of somewhat crude and unfinished design, as if the problem of “dressing up the N91 in black” was solved in a couple of days by recently-graduated designers. All this is my subjective point of view and unlike me, you might find the design appealing. By the way the buttons could have been made red, which would’ve added a pinch of aggression, like on Nokia 5500 ME. 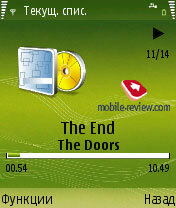 - Themes have been marginally shape-changed – by default the handset has slightly modified (compared to the N91) “Stave” theme set. Judging by the figures by the manufacturer, the battery life is at the same level, at the revamped N91 retains the good-old 900 mAh battery Nokia BL-5C, whose talk time makes up 3-4 hours and standby time – 190 hours. If you leave out its music capabilities (and in fact the hard drive), the life time will go up substantially. Basing on my experience, used as a phone-only device the N91 8 Gb works for about 2 days, and should you be a tad heavier on its music department with a few hours of music playback, then rest assured – in the evening of that day a charger somewhere around will be a must. It is clear, though, that it all depends on your particular usage mode. - Revamped unique (only for the N91i) remote with LCD display, ability to view the phonebook, navigate the music menu etc. - Scaling-down of the casing, with metal still constituting the base of the chassis, maybe availability of several color schemes. 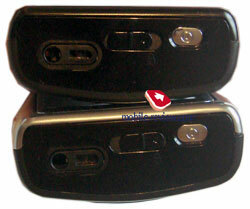 - 3 Mpix camera (as on Nokia N80), with huge sliding cover, as on the N73. As you see, some options on the wish-list have come to life, but not all. Initially Nokia N91 8 Gb’s price will strongly depend on given region – I guess at first it will retail for about 800-900 USD, where are the 4 Gb edition costs approximately 600 USD today. Those who haven’t been able to get their hands on the original N91 I recommend waiting for a couple of months and then purchasing the updated version, if you don’t get confused by the color. By “those” I mean people looking for a prime, fashion, music-tailored solution, with everything else being second to these aspects (this holds true for the phone features as well, since sliding action is still not customizable). 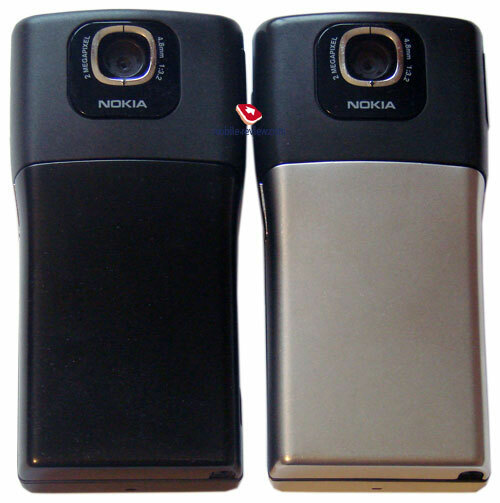 Getting the N91 8 Gb to accompany a Nokia 8800 or the 8800 SE as a secondary device for entertainment makes some sense – which will leave you with a hedonist’s suite on hands. 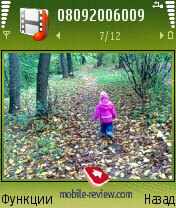 - Enhanced gallery and sound recorder (can be achieved via third-party applications). - Subjectively speaking, the device feels better built, but on one of the snaps you can see that the coating on the back cover locker has come off. On my intensively used N91 the paint is still on. As you see, the advantages are few, and on top of that some of them are minor. As regards the A2DP, it is more of a toy rather than a vital feature – if the battery was more capacious, then we would have no problems listening to tunes wirelessly, without having to check battery status every five minutes. Hard drive capacity – a big change, but do you really need that much? Personally, I listen to every new 4 Gb of music about 2-3 weeks before I get all-round new library. Overall, the choice is up to you, and as for me, I am waiting for the next fashion music-heavy solution by Nokia, and if there won’t be any, well, I will be down to buy the N91 8 Gb. Regrettably, in a color that I really don’t like.